Sarah Crowner is an artist and erstwhile set designer based in Brooklyn. Her recent solo exhibitions include shows at Galerie Nordenhake, Stockholm; Catherine Bastide, Brussels; and Nicelle Beauchene in New York. She is currently working on an artist’s book to be published by Primary Information in September 2012 and her work will be included in an upcoming 2013 exhibition at the Walker Art center about new directions in painting. February 15, 2012 February 27, March 7, 2:30–4 p.m. Cell phone photo sent via email by David Horvitz, February 6, 2012. Triple Canopy is pleased to announce Miscellaneous Uncatalogued Material, a series of public programs organized as part of the Museum of Modern Art's Print Studio, which explores the evolution of print-based artwork in recent decades, from the revival of traditional techniques to the employment of new digital technologies. Join artists Sarah Crowner and David Horvitz and poet Ariana Reines, as well as Triple Canopy editors and guests, for discussions about the nature of publication, which will lead to the production of the second edition of our Volume Number series. Each program will examine the relationship between specific objects in the MoMA collection and contemporary art practices, focusing on new forms of public discourse, knowledge production, and circulation fostered by digital technologies. Crowner, Horvitz, and Reines will facilitate the conversations and, with Triple Canopy, edit transcripts and compile related materials for an edition of Volume Number to be designed by Tiffany Malakooti. 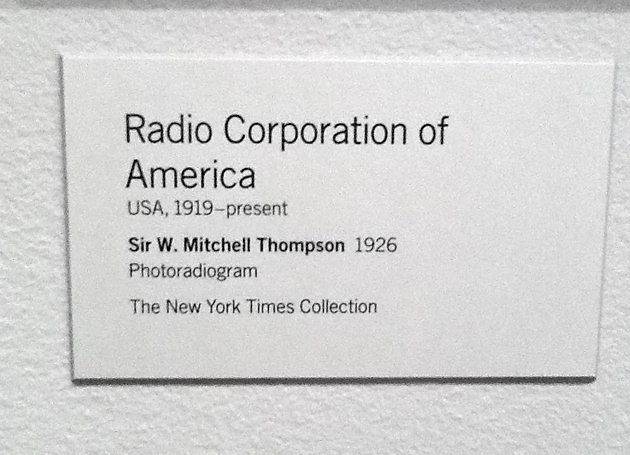 Wednesday, February 15, 2:30–4 p.m.
David Horvitz discusses Radio Corporation of America's Sir W. Mitchell Thompson, a photoradiogram from 1926. Monday, February 27, 2:30–4 p.m.
Sarah Crowner discusses Marcel Duchamp and Man Ray's The Blind Man, a periodical with negative photostat from 1917. Wednesday, March 7, 2:30–4 p.m.
Ariana Reines discusses Sherrie Levine's Gustave Flaubert: un coeur simple, an artist book from 1990. Volume Number is a publication cycle that reimagines the magazine as a framework for activities that occur beyond—but are ultimately enfolded by, and digested within—its pages. In the coming months and years, Triple Canopy will produce a series of publications, in formats ranging from the broadsheet to the PDF to the poster, that emerge from and feed back into discussions, workshops, and other public engagements. The publications aim to be generative rather than documentary, absorbing these engagements rather than merely representing them. Instead of simply printing the work of artists and writers, Volume Number will provide a variable space for Triple Canopy’s editors, collaborators, and audiences to think through—and enact—the practice of publication, instantiating the public spaces magazines purport to produce in the world. Print Studio is organized in conjunction with the exhibitions Print/Out and Millennium Magazines, organized by Rachael Morrison and David Senior.